As some of you may know, I am part-way through moving out at the moment and so all my baking gear has been packed away in boxes for the last couple of weeks. This makes me very sad. What am I supposed to do to destress? Without my piping bags, cake lifter, icing nozzles, spatula and madeleine tray I am nothing. By way of compensation, I'm going to write a blog post I've been promising to do for a while. 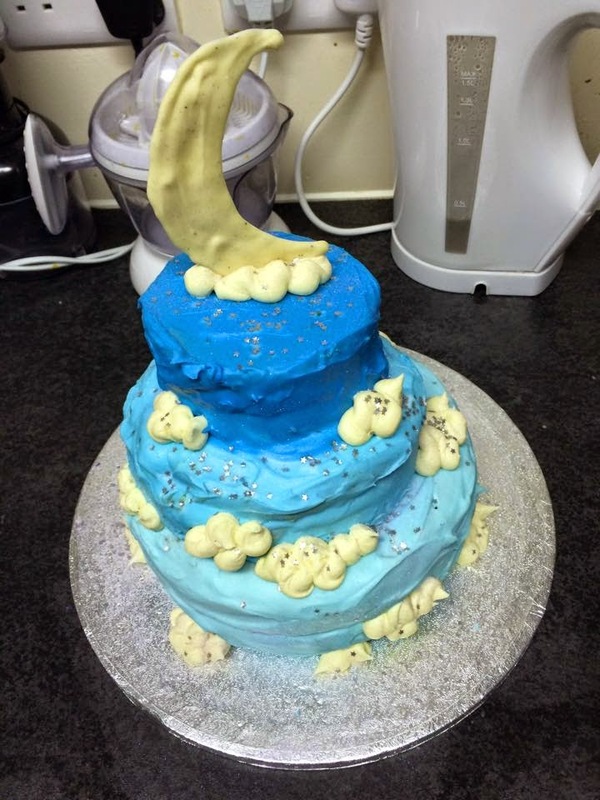 You may have noticed that although I sometimes make novelty cakes, I rarely blog about them. That's because when I construct one of these marvels of confectionery, my process is less a meticulously planned operation than a panicked, buttercream-spattered flurry of activity. By the end, I won't know what quantities of ingredients I used, because I'll have run out and had to go to the shops so many times I've lost count. I’ll also be a nervous wreck and will have to go and lie down in a darkened room for a while. So as I don't tend to record individual recipes I'm going to lay out a series of tips to help you make your own novelty cakes. Because after all, the best novelty cakes are unique. I always sketch my novelty cakes before I start trying to make them. It helps me work out what ingredients I'll need to get hold of, which types of techniques I might have to use, how I might decorate the cake and what shape baking tin is closest to the final shape of the cake. Have a Google around and look at cakes similar to what you want to make. Chances are, someone will have made something similar before. That's how I found out that ice cream cones covered in sprinkles made perfect turrets for a castle cake. Don't get over-ambitious with the kind of sponge you're going to use as the basis of your novelty cake. Just like a building, your cake must be structurally sound. Use a simple recipe, something that is easy to slice and has a consistent texture - try not to add anything like fruit, nuts or chocolate chips that could change the texture. Victoria sponge is a good bet, as is pound cake. If you're making a cake in a novelty shape you may want to carve it out of a larger cake. Use a deep baking tin and fill it with sponge mixture to bake a large rectangular cake. Pop it into the freezer until needed and start to carve it carefully into shape with a knife while it's still cold. You may not be able to make all your cake out of sponge. In the above picture, the dragon's neck is made of rice-crispy cake, while its legs and tail are cake pop mixture, which I also used to round out the shape of the body. For cake pop mixture, blend an equal amount of buttercream icing and sponge together to make a paste which can then be moulded into shape. Rice-crispy cake is great option in cases where sponge won't be strong enough. Melt 45g butter and 300g marshmallows and mix in 180g rice crispies then mould into desired shape and pop in the fridge to set. Choose your icing to suit your cake. If you're making an animal cake, like this orangutan, use buttercream and fluff it up with a fork for fur. If you're making something with a smooth texture, ready made sugarpaste (sometimes called regal icing) or royal icing might be better. For a scaly texture roll out sugarpaste and cut out tiny circles. If using sugarpaste you will need to stick it to the cake with a thin layer of buttercream spread underneath. If you are sticking one piece of sugarpaste onto another, for instance in overlapping scales like the dragon cake, you will need to use edible glue or make an adhesive out of water icing or similar. Attention to detail can make a novelty cake really special. This cake I made for my friend Sophie looked a bit rubbish until I piped buttercream clouds onto it and covered it in edible silver stars and glitter. For all my animal cakes' eyes I use white chocolate chips with a tiny bit of dark chocolate piped on for pupils. 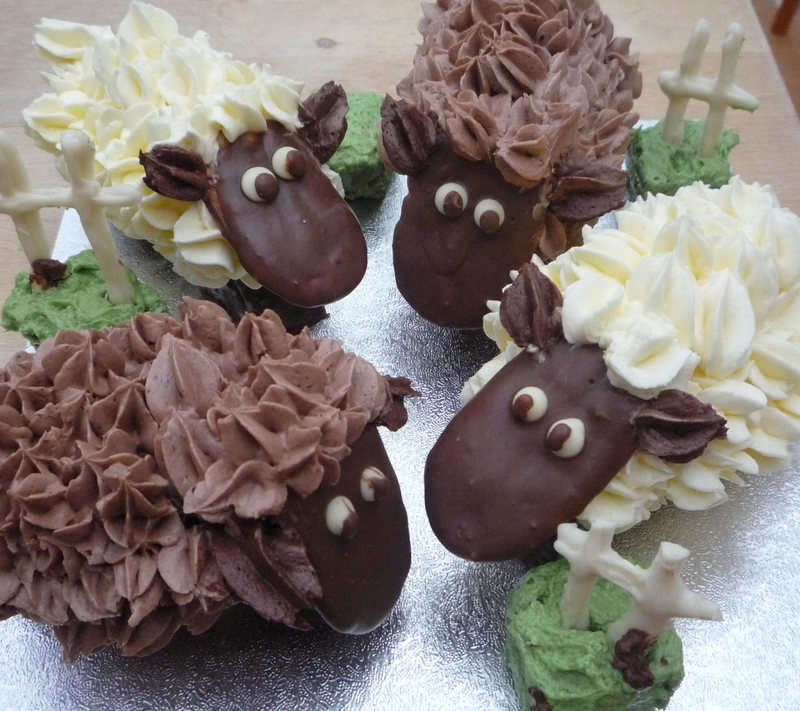 The squares of sponge with peppermint icing grass and white chocolate fence-posts, complete with smears of mud, make the sheep cake into a proper little scene in a field. The dragon cake comes with a hoard of chocolate money - need I go on? Above all, don't be afraid to experiment, adapt others' recipes and buy way way more ingredients than you think you need - you almost certainly will run out. Unless you're going to have about 2 days to make your cake, make what you can in advance. Sponge and buttercream icing will both freeze well as long as they are kept separate. Do not store either in the fridge - trust me on this! And don't make your life harder than it needs to be. Sometimes a plain old cylinder is the right shape for your novelty cake. And a novelty cake doesn't have to be a montrously huge confection either. Sometimes a few little touches can transform cupcakes into magical creations. Go forth and bake, my pretties.